arrived to take the tree down and subsequently cut-out the log for me to take away. 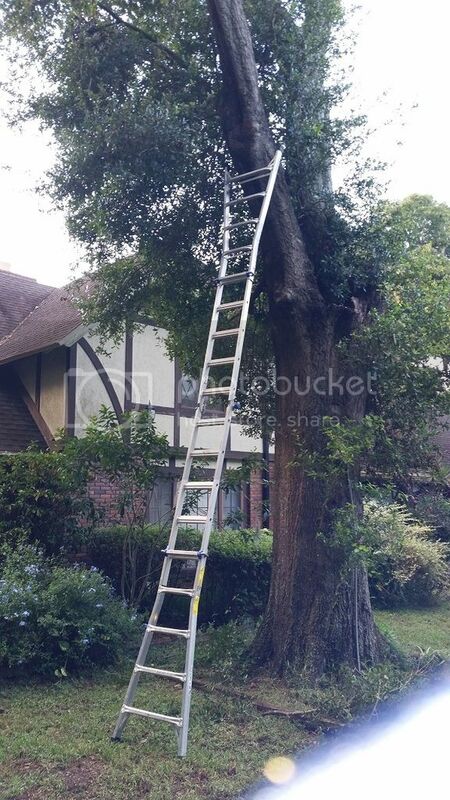 Meanwhile, here's the photo of the ladder against the tree. The hive is just above the top of the ladder. to make an 8:30 pm run to Lowes all sweaty in your bee suit. Oh, and that ladder wasn't tall enough. Luckily the customer had a long extension ladder on premises so I didn't have to go home and get mine. You were lucky this colony survived without the queen being injured or killed. The branch must have fallen about twenty feet. Was there no way of cutting the top part of the branch off above the colony, then roping up the lower trunk with the nest and then cutting below and lowering it down more gently? How long did the bees stay angry? Yes, there was a way to do all that you mentioned, but I was dealing with a tree trimming company who wasn't about to take any advice from me as to how to take that tree down. I was in no way running the show. My job was to seal that hive and then haul off the log and to shut up in between that time....lol. As far as how long did they stay angry? I have no idea. That was only a couple of days ago and I haven't been back over to Ms. Anne's place to see how they are doing. I'll give a report on them the next time I see them.